With Kalas we got another partner on board who can convince with quality. 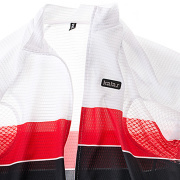 Not for nothing Kalas is a leading manufacturer of bicycle clothing in Europe. Olympic champions, World Champions, national teams and many other teams wear Kalas. People sometimes might not know that, but maybe it’s because the brand is known for understatement and “customized clothing”. No compromise, even in our own 54/11 Bikeholiday collection, which of course also comes from the production of this company, and thus is of high standard of quality. Zdenek Stybar and Kalas, two Czech success stories that are far from written to the end!